National Instruments has released its first USB modules for high-speed and low-speed/fault-tolerant Controller Area Network (CAN) and Local Interconnect Network (LIN) monitoring, logging and testing, combining the quality and performance of NI CAN software and hardware with the benefits of Hi-Speed USB. With a low price point and a synchronisation option, engineers now have an easy, cost-effective and portable solution for connecting their PCs to CAN and LIN devices and networks for device validation, test and in-vehicle data logging. The new USB-847x interfaces do not only make it easy to link PCs and laptops to automotive networks; each interface is available with a unique synchronisation option that allows it to share start triggers, and timestamps with other USB CAN and LIN interfaces, as well as with data acquisition, vision and motion devices such as NI CompactDAQ and bus-powered M series multifunction data acquisition modules for USB. Users can synchronise CAN and LIN data with multiple types of measurements with microsecond resolution. An engineer conducting an in-vehicle noise, vibration and harshness test, for example, can monitor sensors and then determine the state of ECUs on the network if test thresholds are exceeded. The USB-8476 LIN interfaces are the first LIN devices released by NI. LIN, a single-wire communication bus, is a cost-effective option for networking automotive smart sensors and actuators that do not require the bandwidth and versatility of CAN. The LIN interfaces can function in master, slave and monitor modes and are fully compatible with 1.3, 2.0 and J2602 LIN standards. All six of the interfaces feature hi-speed USB technology. An onboard hardware buffer, combined with the 40X improvement in bandwidth of hi-speed USB over full-speed USB, ensures that the USB modules do not drop frames, even while transmitting and receiving 100 percent bus loads at speeds up to 1 Mb/s. The interfaces are bus-powered, with integrated transceivers and a captive USB cable, for rugged, plug-and-play functionality at a lower price point than comparable USB interfaces. According to Eaton Corporation, using National Instruments LabVIEW and the new USB CAN interface, they were able to quickly develop a suite of robust and easy-to-use applications that record vehicle bus data, which will be used by field personnel and test engineers. The design is ideally suited for field use, and the price of the USB CAN interface was essential in keeping the total cost under budget and will allow Eaton Corporation to deploy the application throughout the field. 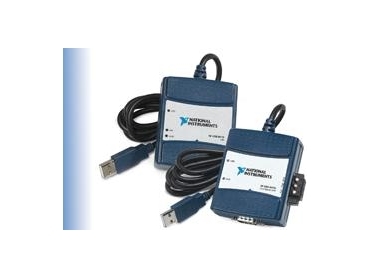 The new USB modules include NI-CAN driver software for rapid application development. With a powerful frame-based API, engineers using NI-CAN can develop and operate applications in a variety of programming environments, including National Instruments LabVIEW, LabWindows/CVI and Measurement Studio, as well as Microsoft C/C++ and Visual Basic. Additionally, NI-CAN driver software includes a CAN and LIN bus monitoring utility for immediate, out-of-the-box monitoring and logging of bus data to disk. With the new modules, NI has extended its family of PCI, PXI and PCMCIA CAN interfaces to include portable, low-cost and high-performance USB solutions for building custom test, monitoring and logging applications that meet the needs of today’s complex automotive networks and devices.